During a pre-dawn scouting mission up Cache Creek on a morning when temperatures hovered around -25 degrees, Diener found these patterns on a cabin window. “This beautiful artistry, the detail and symmetrical structure designed by nature, always blows me away,” he says. Thick hoar frost decorates the branches of a willow along the banks of Flat Creek. Hoar frost is formed from water deposits frozen in humid conditions. Fragile, it covers most every branch on the coldest mornings and gives off a brilliant, sterile glow. “A slight wind or warming of the sun can strip these delicate crystals, so you’ve gotta get out there early before it’s gone,” Diener says. A frigid day with high winds helps to form this banner cloud flagging off the summit of the Grand Teton. “After a full day of skiing, we headed back to town, and I was able to use a long lens to isolate the final breath of sunset glow backlighting the clouds,” he says. For some photographers, the secret to shooting is not found in megabytes and file sizes. More often it’s being in the right place at the right time. 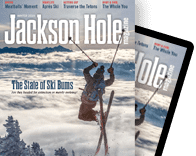 For Jackson photographer Jeff Diener, capturing the beauty and grandeur of the Tetons dipped in the deep of winter produces artful photographs, a change of pace from his usual work shooting outdoor gear and products. When he’s out scouting locations for product and gear shots, Diener zooms in on details that make the darkest time of the year interesting—from hoar-frost-laced landscapes draped in warm light to foggy, subzero mornings.